Warm melted Cheese seasoned and served with Flour Tortilla Chips. Fresh Avocados blended and served on a bed of crisp Lettuce and Tomato. Delicate Fresh Fish, Shrimp & Scallops marinated in Lime Juice, served with Onions, Jalapenos, Tomatoes and Cilantro. Warm melted Cheese with spicy Bacon and our House Salsa Brava. Jalapenos stuffed with Jumbo Shrimp & Jack Cheese. Deep fried to perfection. Served with Sour Cream, Guacamole & Jalapenos. Beans and Cheddar Cheese atop all Nachos. Served with Sour Cream, Guacamole & Jalapenos. Mushroom, Bell Pepper, & Onion, sauteed to perfection. Mushrooms, Tomatoes, Onions, Jack Cheese, with tender chunks of Chicken, Served with Rice. Avocado Slices, and Tortilla Strips. Delicate Pork Roast pieces and Hominy, in a spicy Chili Ancho and Chili Cascaibel Broth with Cilantro, Onions and chopped Jalapenos. Choice of Ground Beef or Ranchera Chicken, atop Mixed Greens, Tomatoes, Cheese, Purple Cabbage. Fresh Greens with Jicama, Avocado, Red Bell Peppers, Red Onions & Mango. Served with our special Raspberry Vinaigrette or Creamy Lime Cilantro Dressing. Our delicious Fajitas are made from the finest ingredients, served with handmade Flour Tortillas, Guacamole, Sour Cream, Pico de Gallo, Mexican Rice, and Charra Beans. Choice of Beef, or Chicken Fajitas. Four succulent Jumbo Shrimp grilled in our special Garlic Butter Sauce and Choice of Fajita Meat. A slab of Pork Ribs, with spicy or mild BBQ Sauce. Served with Mexican Rice, Charra Beans, Pico De Gallo, and Guacamole. Large Flour Tortilla stuffed with Refried Beans & Queso. Served with Rice and Guacamole. Refried Beans, Queso, & Enchilada Gravy. Ground Beef, Refried Beans topped with Enchilada Gravy & Cheddar Cheese. Shredded Ranchera Chicken & Refried Beans, topped with Enchilada Gravy and Jack Cheese. Chicken or Beef Fajita, Refried Beans, topped with Cheddar Cheese & Enchilada Gravy. All Entrees are served with Mexican Rice & Refried Beans. 2 Handmade flour tortillas filled with slow smoked sliced Brisket. Served with Mexican Rice, Charra Beans, BBQ sauce, Guacamole, and Pico de Gallo. Beef, or Chicken Fajita with a Pork Tamale. Beef, or Chicken Fajita and 2 hand rolled Chicken Flautas. Beef, or Chicken Fajita and a Cheese Stuffed Poblano Pepper, dipped in seasoned batter & fried. Authentic Mexican Stew with Spicy Beef, Onion, Bell Pepper & Tomato. Three Hand Rolled Chicken Flautas with Guacamole and Sour Cream. Large Flour Tortilla Flauta stuffed with Ranchera Chicken, deep fried and served with Rice, Refried Beans, Chili con Queso & a Guacamole garnish. 2 Ground Beef or Ranchera Chicken Crispy Tacos, with Lettuce, Tomatoes, and Cheddar Cheese. 2 Ground Beef or Ranchera Chicken Soft Tacos, with Lettuce, Tomatoes, and Cheddar Cheese. A Ground Beef or Ranchera Chicken Crispy Taco, Cheese Enchilada and a Hand Made Pork Tamale. Ground Beef or Chicken Ranchera Crispy Taco, Cheese Enchilada, Cheese Chili Relleno and Pork Tamale. Ground Beef or Chicken Ranchera Crispy Taco and Two Cheese Enchiladas. Handmade crispy Corn Tortilla, topped with Refried Beans, melted Cheese, Lettuce, Tomatoes and choice of Beef, or Chicken Fajita. Two Cheese Stuffed Poblano Peppers topped with our Ranchera sauce and Jack Cheese. A Chicken Breast stuffed with Monterrey Jack Cheese, Pico, Salad Shrimp, and topped with 2 Jumbo Shrimp, Creamy Wine Sauce & Mushrooms. Two Pork Tamales, topped with Chile Con Carne and Cheddar Cheese. Slowly simmered tender Pork Roast Pieces. Crawfish Enchiladas topped with a Parmesan cream sauce with a hint of Cayenne. Cheddar Cheese and Enchilada Sauce. Ground Meat topped with Chili Meat Sauce. Sauteed Spinach with Onions, Mushrooms & Jack Cheese mix, rolled in hand made Flour Tortillas. Topped with Cilantro cream sauce, Cheddar and Jack Cheese. Pork Carnitas or Chicken Fajita enchilada topped with Crema Suiza, Monterrey Jack Cheese, Avocado slices and Sour Cream. Shredded Chicken in our Spicy Ranchera Sauce topped with Jack Cheese and Sour Cream. Choice of Chicken, or Beef Fajita Meat in a Chili Meat Sauce, & Cheddar Cheese. In a Corn or Flour Tortilla, Topped with our Special Barbecue Enchilada Sauce & Cheddar Cheese with Guacamole garnish. In our Delicious Spicy Ranchera Sauce. Ice Cream Dipped in Cornflakes & Toasted Sesame Seeds then flash fried and sprinkled with Pecans, Raisins and our Homemade Cajeta Sauce. Traditional Mexican Bread Pudding topped with our Homemade Rum Sauce. Gently fried Pastry Strips, rolled in Sugar & Cinnamon, served with our Cajeta Sauce, Chocolate Sauce and Strawberry Sauce. A special blend of Tequila of your choice from our signature line. Grand Marnier, Patron Citronage and our own Sweet and Sour. Ask your server for Tequila choices. Cuervo Gold Tequila, 2 triple secs, our own Sweet and Sour and Olive Juice. 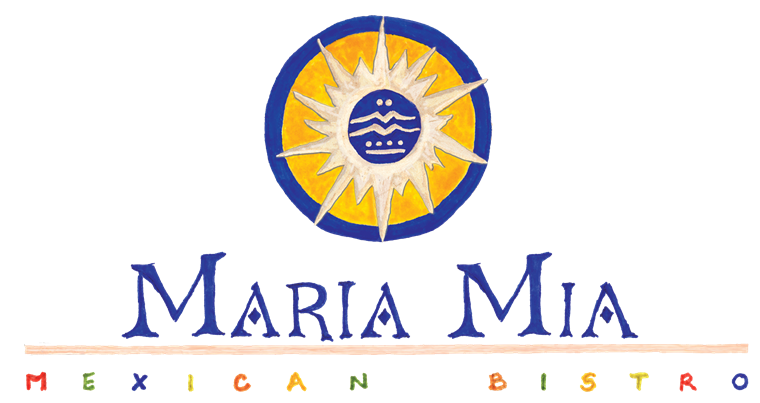 The Maria Rita plus your choice of Beer. Sauza Conmemorativo, 2 triple secs and our own Sweet and Sour. Mango Rum, Mint Leaves, Lime Sparkling Water, served on the rocks.